What about playing at b instead of a, especially when there's little room left for White at left side ? HolIgor: This is not a very well defined question. 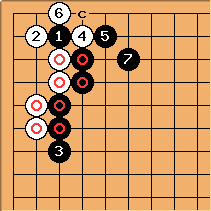 The 3-3 point invasion is not what I call an early corner joseki. 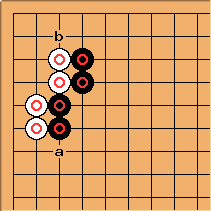 It is played later in the game when the surrounding stones define the strategy. And the first question Black has to answer is usually: the direction in which you'd like to have influence. If White has not much space to develop on the left side, it is possible that Black would have a nice territory pressing from the other side. 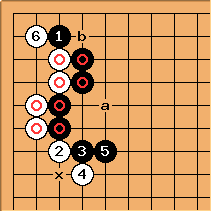 The next thing Black has to consider is playing double hane with the purpose of exchanging the outside for the corner. And yet, there are situations where b is good. Andrew Walkingshaw: I'd be suspicious of the bad aji this leaves. HolIgor: in this diagram looks not so good. I'd play at instead. Now Black's b followed by White's a is bad shape for Black, as above, and if Black plays at a, cutting at b is superior to the normal result round here - White has no hane at c.
HolIgor: If Black chooses for some reason, then b is automatic. It is not a bad shape. 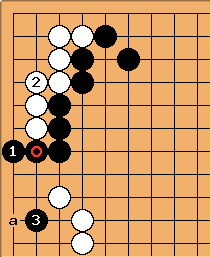 In reply to White a, Black can play hane in the corner and then c. The white group on the left can still be bullied, so the variation can be quite good. The question is if it is better or worse than other possible variations for Black. And this cannot be answered without the knowledge of the whole-board situation. HolIgor: I agree that here Black was inconsistent and lost as the result. Tapir: Please help, which aji? I don't see any additional points or additional possibilities for white here. Herman Hiddema: Under normal circumstances, if black gets the marked stone and the descent to , he can kill white (see Joseki-related life-and-death example 2). 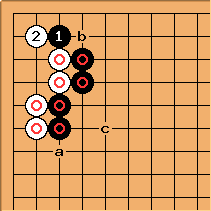 So in the diagram as shown, the descent to the first line would be sente, requiring white to defend the corner. Black could then jump to , swiping away a lot of white territory. If the descent is not sente, then the best black can do is play the monkey jump to a. is of course much better endgame.